Most of us already know that meditation is an excellent practice for mind, body, and spirit, but how many of us actually make a point to set time aside to meditate on a regular basis? Each day we wake up to is a new opportunity to grow, to expand in consciousness, and to progress one step closer to full awareness of our true, divine identity. Meditation is a focus of our desired direction in these pursuits. Each day is a new test to show us just how brightly our inner light can shine. Consequently, it is not only important for us to acknowledge the undertaking of meditation as good, but to give ourselves the benefit of this practice on a regular basis. 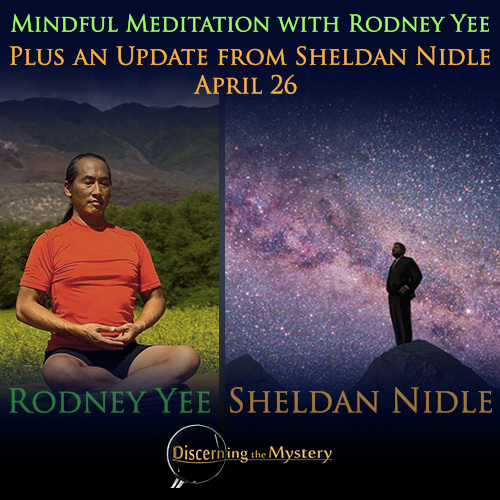 With this in mind, we turn to the guided meditation of Rodney Yee. ...But first, here is a short word on Rodney's background. Yee has also been featured on calendars, magazines and natural product advertisements; narrated meditation audios; written a book; and done extensive charitable work. He has made guest appearances on The Oprah Winfrey Show, CNN, PBS, and elsewhere. Rodney Yee was born in 1957, the Chinese-American son of an Air Force Colonel, and spent his childhood on military bases in Altus, Oklahoma and Puerto Rico. He was a gymnast during his high school years and later became a ballet dancer, performing with the Oakland Ballet Company and the Matsuyama Ballet Company of Tokyo, Japan. He began studies in philosophy and physical therapy at the University of California, Berkeley, though he dropped out in order to pursue ballet full-time. Yee became a yoga enthusiast in the Iyengar school, but now teaches a blend of Iyengar Yoga and his own invented style. He began his Yoga teaching career at a studio called The Yoga Room in Berkeley; later, he co-founded the Piedmont Yoga Studio in Oakland. Yee now teaches around the world at workshops, retreats, and conferences. If a person does the research, they may find that Rodney's history is eclectic, and at times, it may have been controversial. However, it's my belief that the skill and contribution an individual brings to the table is much more important than their background. Though their history can give insight into the origin of their expertise. (You must have an account with GaiaTV in order to enjoy these videos. their long reign is just about over. Your victory is in sight!